➤ Wildland fire is a global issue for all climates, from mediterannean region to boreal ecosystems with 3-4% of continental vegetal surface burning each year. 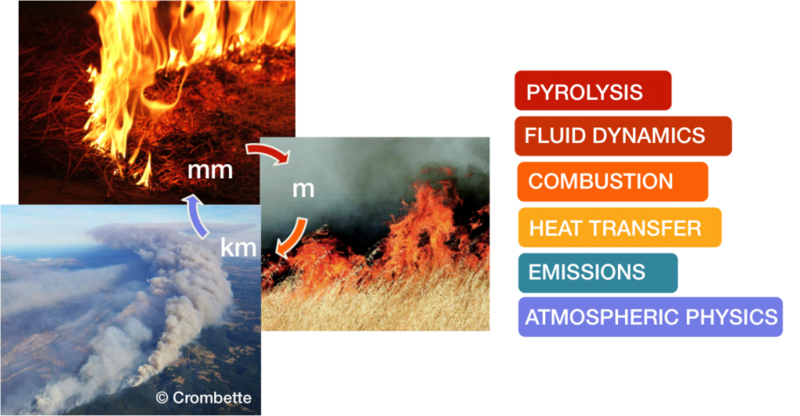 The risk associated with wildland fire relates to crisis management (for instance, charte internationale Espaces et Catastrophes majeures), air quality due to high emissions in the atmosphere (carbon dioxide, nitrogen oxide, organic volatile components, aerosols, …), for example in the Prev’Air system. ➤ Wildland fire modeling is a complex question as it couples numerous physical processes at a large range of spatial scales (from local vegetation scale to meso-scale atmospheric dynamics). As of today, the ability to forecast large scale wildland fire remains limited: major uncertainties relate to the description of environmental (vegetation, geomorphology, meteoroloy) conditions as well as approximate description of interactions between vegetation, fire and atmosphere. These uncertainties translate into errors in the simulation of the fire intensity, the generation, the transport and the chemical evolution of plumes of smoke. ➤ The Wildland fire research project is part of the MODEST challenge. 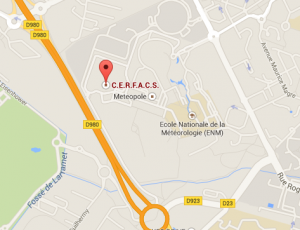 It is at the crossroads of transversal axis at CERFACS such as “Data Assimilation” and “Uncertainty Quantification”. Developed in collaboration between CERFACS and the University of Maryland, FireFly is a data-driven front-tracking simulator based on the assimilation of thermal-infrared imaging data, with the goal of improving wildfire spread forecasting for public safety and environmental protection. An ensemble-based data assimilation algorithm allows to sequentially correct input model parameters (surface wind, humidity and description of the vegetation properties) in order to improve wildland fire propagation forecast. ➤ Improve the wildland fire behavior in terms of surface propagation as well as in terms of emissions released to the atmosphere. ➤ Develop ensemble-based data assimilation methods while limiting the computational cost, for instance using uncertainty quantification methods, especially for stochastic estimate of error statistics. The FIREFLY platform is developed in collaboration between CERFACS and the University of Maryland. FireFly simulates wildfire spread scenarios at regional scales. FireFly is a data-driven front-tracking simulator based on the assimilation of thermal-infrared imaging data, with the goal of improving wildfire spread forecasting for public safety and environmental protection. An inverse modeling strategy is applied, based on the assimilation of the fire front location. The idea underlying the ensemble Kalman filter (EnKF) strategy is to translate the differences in the observed and simulated fire front locations into a correction of the environmental parameters (ex: biomass fuel moisture content, near-surface wind) or directly of the simulated fire front location. FIREFLY relies on the OpenPALM software developed by CERFACS and ONERA to combine the propagation model and the data assimilation algorithm. • 2015 : Application of FIREFLY to the FIREFLUX experiment (controled fire over 30 acres) in the framework of Cong Zhang’s PhD (UMD). • 2014 : Comparison of parameter and state estimation in analysis and forecast mode. • 2013 : Extension of FIREFLY to the treatment of fire propagation over complex terrain topography. • 2012 : Participation in the CTR Summer Program, Stanford University : Implementation of a polunomial chaos strategy in the framework of ensemble-based data assimilation. IMFT and CERFACS win a second ERC (European Research Council) advanced grant in combustion !